For millions of television viewers, actor Richard Lintern is best known as a pathologist – but this month he switches medical professions to become a psychiatrist. Richard, who has played Dr Thomas Chamberlain in six series of the hit BBC drama Silent Witness, is taking on a new role in the play Blue/Orange at Birmingham Repertory Theatre. Written by Joe Penhall, Blue/Orange premiered at the National Theatre in 2000 before transferring to the West End and picking up a raft of awards. It tells the story of Christopher, who is sectioned to a psychiatric unit where professionals wrangle over his diagnosis and treatment. When Christopher tells the specialists he is the son of the former Ugandan president Idi Amin, he opens a Pandora’s box of racism, misunderstanding, prejudice, professional rivalry and bigotry. 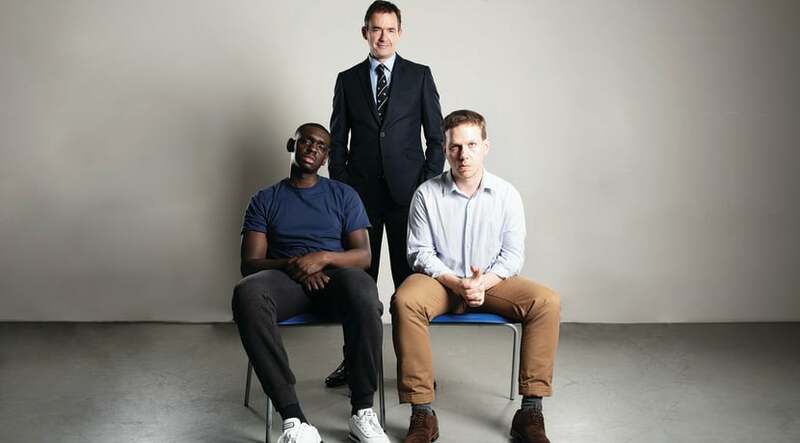 Richard plays the senior consultant Robert alongside Thomas Coombes as junior consultant Bruce and Ivan Oyik as Christopher in the new production directed by Birmingham Rep’s associate director Daniel Bailey. And Richard says both the play and his role are thought-provoking. “Whenever I talk to my friends about the play, if you don’t present it in the right way, it sounds like the worst play in the history of the world because it’s about mental health and race,” Richard says. And Richard believes audience members will also have strong opinions over the decisions surrounding the future for Christopher. “The two psychiatrists, a younger one and an older one, have very different views about how the young man should be treated. The specialists are not just influenced by their age and experience – their views are also coloured by the fact that Christopher is black. “Race massively impacts on those decisions – whether there’s an unconscious bias or a conscious bias,” says Richard. “I’ll leave the people who come and see the show to decide whether or not, certainly my character, has a hidden agenda. Blue/Orange was one of Joe Penhall’s first successful theatre productions. His other works include The Kinks’ musical Sunny Afternoon, Mood Music which premiered at the Old Vic last year, the Netflix series Mindhunter and he also wrote the screen adaptations of Ian McEwan’s Enduring Love and Cormac McCarthy’s The Road. Blue/Orange may have been written nearly two decades ago but Richard says it hasn’t dated at all – in fact its themes may be even more pertinent in 2019 than they were in 2000. “The reason I was attracted to do the play is because it’s a terrific piece of theatre,” Richard says. “It was a massive success in the West End and there’s a reason it’s being revived. The issues are as contemporary and relevant today, if not more so, than they were when this play was first written 20 years ago. You can’t open a paper these days without reading about teenagers struggling with depression or women or men having issues around mental health. “It’s rather a sad thing to say that the themes are still so relevant. If you’d asked the people who did the play originally if they’d thought that 20 years in the future these issues of race and mental health would be as relevant and as full of controversy now as they were then, they would probably have said not. They would have expected us to make progress on them.